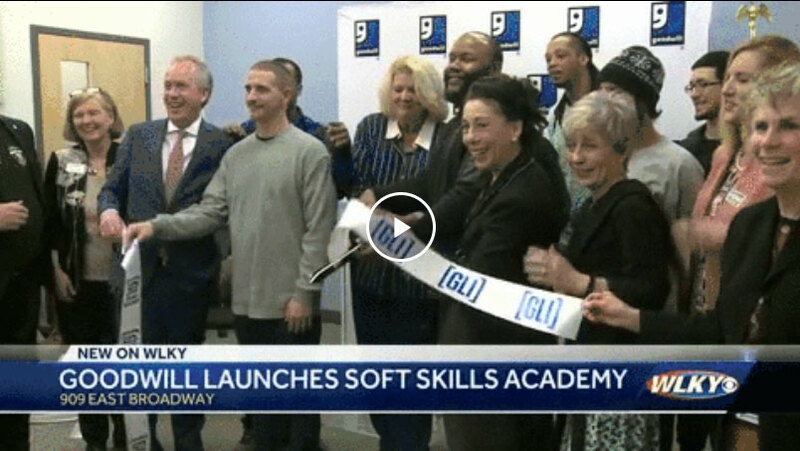 Louisville, KY – On Monday, March 19, Goodwill Industries of Kentucky formally introduced its Soft Skills Academy, housed at the Goodwill Center for Education and Employment at 909 E. Broadway. The program has been piloted for several months, serving clients from the Louisville Metro Department of Corrections and several nonprofit organizations, including Volunteers of America. The event featured a graduation ceremony and presentation of Work Ready Certificates for participants of Goodwill’s Soft Skills Academy. Graduates learned critical workplace skills including attitude, conflict resolution, dependability, safety, self-presentation, and team building. During the training and following graduation, Goodwill career coaches work with participants one-on-one to further prepare them for and secure employment, ensuring that the job seeker’s skills are matched appropriately with an employer’s needs and requirements. After placement, Goodwill career coaches stay engaged with both the employee and employer to assist with any issues that could put the person’s continued employment at risk. Ryan Jones is director of operations for Rev-A-Shelf, Goodwill’s inaugural partnering employer for its new service model. He spoke about the company’s partnership with Goodwill and introduced Timothy Copas, an employee placed by Goodwill who recently celebrated his 60th day on the job. Louisville Mayor Greg Fischer attended the event and congratulated the graduates, commenting that Louisville’s core value of compassion lends itself to success in both workforce and economic development as time is dedicated to developing job seekers’ soft skills and on-the-job character. In the 2017 fiscal year, Goodwill placed Kentuckians into more than 3,400 jobs across the state – both inside and outside of Goodwill – and paid nearly $15 million in wages to Kentuckians with disabilities or other challenges in finding and maintaining employment. Goodwill’s programs and employment services are funded through a combination of grants, corporate and individual giving, and its retail stores, which sell donated clothing and household items at 64 locations across Kentucky.